Christina Bucci is an Associate Broker with over 20 years experience in all dimensions of real estate and rentals. 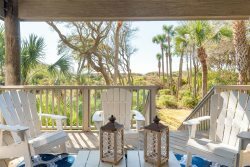 Christina’s emphasis is selling luxury coastal homes and condominiums on the islands surrounding the Charleston area, including Kiawah, Seabrook, and Isle of Palms. She displays extensive knowledge of the area and commitment when representing sellers and buyers in complex negotiations and acquisitions in high end properties. She will leave no stone unturned for her client’s satisfaction. Christina’s performance is further enhanced by her background as both a trauma care nurse and as an administrator of finances and operations of a short term luxury vacation rental company. Her warm, personal demeanor combined with her appreciation for quality make her an ideal agent. In her private time, she enjoys spending time with her husband and three adult sons, traveling, wine-tasting, boating and outdoor activities.